Gawoti is a “learned” raga by which I mean that unlike many major ragas, it leaves the listener with a pleasant, fulfilled feeling, but it’s appeal isn’t very obvious. It’s like enjoying a perfume without actually knowing why it’s so nice. 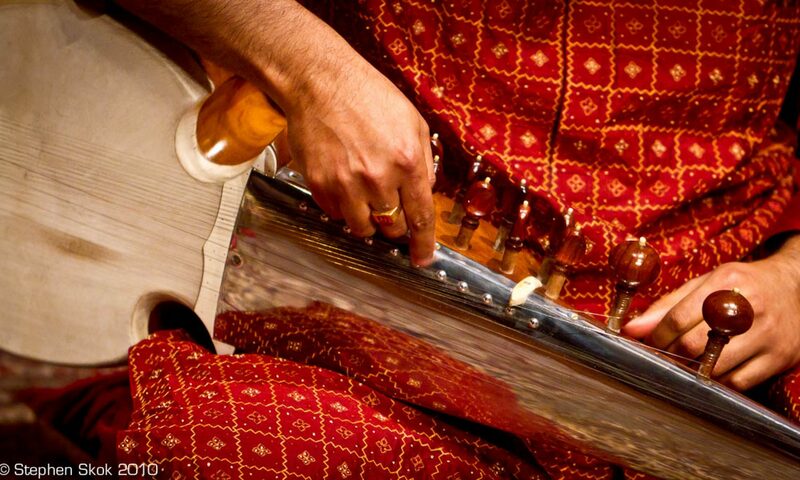 The secret lies in the peculiar gait of the this raga – its particular combination of notes which gives it this flavour and emotion. The particular appeal of Gaoti to me is that it has a “happy” disposition, but there is a plaintive element to it as well. It’s almost like meeting a friend, having a great conversation but as you go to leave, your friend exhorts you to stay in a pleading manner… (the upper notes of the raga played in a particular fashion can evoke this feeling).. I start this off with an except from a practice session exploring the raga in a quick alaap followed by a particular composition in slow 16 beat cycle (vilambit) that I like. The main reason for selecting this one is that it contrasts the happy tone of the raga with the plaintive aspect. Gavati’s signature is S M P N S (upper) D. This signature heralds the arrival of Gaoti, and sets it apart from other ragas. G M P N S D as well. It’s up to each person to interpret it as they choose, but the G must not be overused too much. FYI. I heard Sugato-da perform Raga Gawati on Dec 31st in Kolkata. A video recording of the entire performance was made (by him). In case you’re interested, you can probably ask him for it. A recording of a vocal recital in Raaga Gavati by Ustads Nazakat Ali and Salamat Ali has been in existence for at least 40 years. It was a long playing record and it also had Darbari Kanada and a thumri bundled with it. Of the performers of current generations, I know Smt Gauri Pathare (and many other students of Pt Jitendra Abhisheki) presents a wonderful Gavati. Thank you for your comment. Smt Gauri Pathare is a wonderful singer, as are many students of Pandit Abhisheki ji. The lyrics of the song is exactly as described above.